A: Your instincts will tell you to remain in the center of the screen where you risk the least amount of danger from any potential traps that might appear from either side of you. 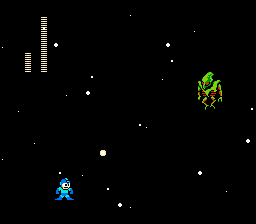 However, in this case you should ignore those instincts, and push Mega Man as far to the right as possible while he continues to fall. Upon entering this room, the lights will dim and Dr. Wily's saucer will fly on to the screen. He will hop out of it, float in mid-air for a bit, and transform into an alien lifeform. This lifeform will begin floating around the room along a path that resembles an infinity symbol (∞). All the while, he will shoot at your current location. If you try every weapon against him, you will discover that nothing will damage him besides the Bubble Lead. Even the Mega Buster is useless. For this reason, it's important that you have a good supply of Bubble Lead ammunition available when you reach this room. If you don't, or if you run out of Bubble Lead, you will be force to die until you can continue your game, at which point all of your weapons are replenished. Because the lifeform spends a good portion of this battle near the top of the ceiling, he lies out of your weapon's reach until he sinks back down to the ground. It is at these moments when you must close in, jump into the air, and drop a Bubble Lead on him. All the while you must make sure that you don't jump into him, and that you avoid his shots as best as possible. It will take 14 Bubble Leads to defeat Dr. Wily, so be patient and time your shots well. Use up any remaining E-Tanks as necessary. Once he is defeated, you will be presented with the game ending, and the staff credits. Congratulations! This page was last edited on 2 January 2016, at 04:55. This page has been accessed 41,940 times.